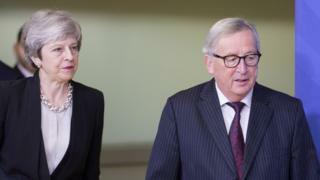 Mrs May spoke to European Commission president Jean-Claude Juncker on Sunday night after a weekend of negotiations failed to find a breakthrough. Talks will resume on Monday morning with the aim of securing changes to the deal before Tuesday’s vote. But the details of it were a sticking point for many MPs when they voted her deal down in January. They worry that – in its current form – the backstop may leave the UK tied to the EU indefinitely. Writing in the Daily Mail, pro-Brexit Environment Secretary Michael Gove said while the prime minister’s deal was a compromise, it should not be rejected “for that reason alone”. Mr Gove also defended the backstop, saying that if it were to be used he could not imagine EU politicians “tolerating” it for long. But former cabinet minister Boris Johnson, who campaigned alongside Mr Gove to leave the EU, said there was “no way” he would vote for the backstop in its current form. Mr Johnson also accused the EU of treating the UK with contempt: “Our negotiators have done their best to explain the UK democratic and constitutional objections to the Irish backstop. He said some MPs wanted to “kill” the deal in order to delay Brexit, and ultimately get another referendum on the issue. “Within three weeks, those people could have two of those three things,” he said. If Mrs May’s deal passes, the UK will leave the EU under the terms of the deal on 29 March. If it is rejected, MPs have been promised a vote on whether the UK should leave without a deal. If they then reject a no-deal Brexit they could get a vote on whether to request a delay to Brexit from the EU. If it reaches that point, public health minister Steve Brine said he would resign unless Tory MPs are given a free vote on the issue. “I would find it very difficult, actually impossible to be part of a policy that was pursuing actively no-deal,” he told BBC Radio 4’s The Westminster Hour.